It may be terrifying to have checkup or treatment especially when it concerns the heart. Electrocardiogram is one of the non-invasive treatments used to find the defective heart cells. But since those electrodes are not directly on the heart, this method lacks accuracy. With the current technology, we need vascular access by a vein or artery to get to the heart, and the inside of the heart, and touch the heart tissue to make these maps from the inside,said Jonathan Hsu, an electrophysiologist from University of California, San Francisco. CardioInsight has developed a new technology that brings solution to this problem.The CardioInsight electrode vest was invented by Case Western Reserve University professor Yoram Rudy and two of his biomedical engineering students, Charu Ramanathan and Ping Jia. It is a non-invasive technology that is worn during CAT scans. 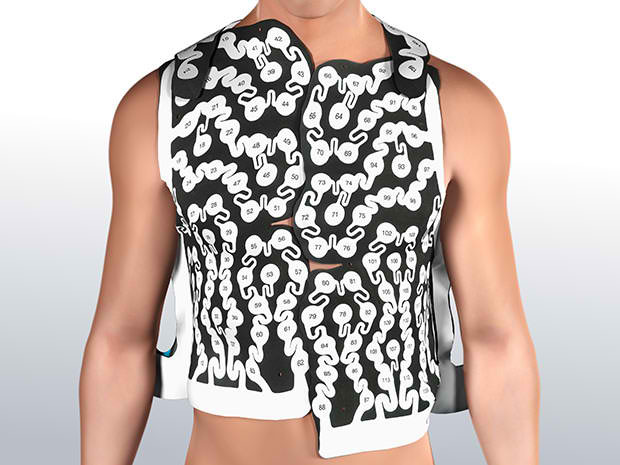 The electrodes present in the vest send data to computers which provide the exact locations of the defective heart cells. A single irregular heartbeat triggers the vest to provide the needed information.It is currently being used by hospitals in England and it has proven to provide the proper ablation points with 90 percent accuracy. It is expected to receive an approval from the United States Food and Drug Administration so that it can be sold in the US next year. Yoram Rudy is still currently thinking of ways to expand the uses of this new technology.Want to know more about this awesome device? Follow this link!